February is Heart Health month and regular sauna use has been shown to help keep your heart healthy. Our Prefab Sauna Kits are a cheaper, easier way to get a sauna into your house, and into your daily routine. We offer different sizes and styles to fit your needs. If you want a sauna customized to fit perfectly in the space you want, we can do that too. To get started head to our Custom Sauna Kit page (the link above), to get started on planning. To begin planning your sauna, start by ordering one of our free samples packs. See the quality of Superior Sauna components before purchasing your sauna kit. Includes samples of home sauna and commercial sauna room building materials. Our sauna woods start from logs and lumber dried to our specifications. Before making a major purchase for the sauna of your dreams, get our sample pack and see Superior Sauna's quality. No Sauna is complete without a heater. The name Polar is your assurance of years of reliable sauna enjoyment due to the integrity of design and use of high quality materials. All Polar heaters come with a Free Accessory Kit. We offer Free Shipping on Junior, HMR, & HNVR models. Besides saunas, we also help design and plan steam rooms. While we let you decide what you want inside your steam room, we provide the important bits. Steam rooms work very differently from a sauna. Their temperature is far lower, but delivers a ton more steam. There is also no wood inside of a steam room. Find an accessible spot to install your steam generator. Depending on what materials you use for your steam room can change how quickly your steam room will heat up. We have created a quick guide for helping figure out what size steam generator/boiler you will need for your steam room. The Amerec family of steam generators has a model for any steam room application. Click to see our entire selection of residential and commercial steam generators. AK Series Steam Generators: Creating the Ulitmate Steam Bath Environment with "Soft Steam". Besides generators we also offer Lighting for steam rooms as well as accessories. Our steam room lighting system is a multicolored system, allowing you to choose the mood you want. We have accessories as well to put the finishing touches on your steam room. Gathering in front of an infrared sauna donated by Superior Saunas of Ashland, are, from left, Fire Captain Dave Wegener, Superior Sauna representative Matt Westlund, Omer Nelson Electric representative Sarah Nelson and Ashland Fire Chief Wayne Chenier. The unit, which was wired up, also as a donation by Nelson Electric, is a prized addition for firefighters, said Chenier. The low-temperature infrared heat will allow firefighters to displace toxins absorbed in firefighting through sweat. It is believed those toxins are the caused for increasing levels of cancers suffered by firefighters nationwide. Ashland will join a small but growing number of fire departments that use saunas as a cancer preventative. With the upcoming Holidays we are taking a little extra time off to spend more time with our families. Do you dream of having your own sauna? Start by ordering one of our free samples packs. See the quality of Superior Sauna components before purchasing your sauna kit. Includes samples of home sauna and commercial sauna room building materials. These are all of the sauna liner materials that fit your pre-framed sauna room indoors or in outdoor building. Our sauna woods start from logs and lumber dried to our specifications. Before making a major purchase for the sauna of your dreams, get our sample pack and see Superior Sauna's quality. Bench, backrest and trim materials have matching 3/4 round radius edges. Magic Energy Massage Pillow uses advance massage technology which helps to reduce fatigue, stress, pain and massage tired muscles. 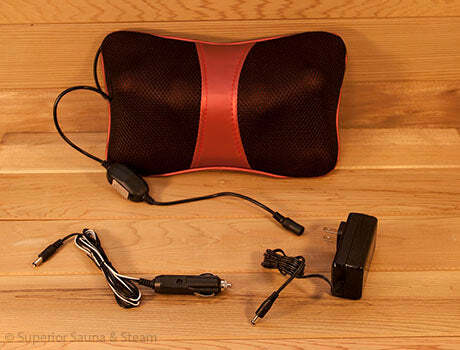 The pillow also uses an infrared heat therapy function to improve blood circulation. 4 massage points and 2 massage directions (clockwise/anti-clockwise) for complete coverage when using on the neck, back, arm, thigh, calf or feet. Portable and simple design suitable for use in cars, offices & homes. Car charger and power adapter included. Made of high quality PU leather and a reinforced mesh. The Club Industry Show was a huge success! While there, we meet many lovely people and had a great time. Above we have a couple of photos of our booth at the show. Easily install a durable snap together an attractive sauna floor in just minutes. Constructed out of quality hardwoods by Finnish manufacturers, these floor tiles are a perfect compliment for your cedar or darker woods sauna. Or create a striking contrast with an aspen or spruce sauna. Excess water flows through wood on plastic snap together grids. Floor temperatures in saunas are always quite cooler making plastic base tiles completely safe to use. If you prefer a more uniform color for you flooring than this is the preferred tile for your sauna. Hardwood Flooring is especially great for high traffic saunas. It has very similar coloring to red cedar, but is stronger and more durable. Feel the rejuvenating spirit of Finnleo Saunas. Finnleo heaters are the heart and soul of the sauna. With exclusive heater designs, Finnleo puts more rocks in direct contact with the elements. The result is pure bliss: a soft steam and an even-tempered heat rising from the rocks. Open air flow design allows quick, effective heating with efficient energy use..
We do not sell Finnleo Heaters on the web, but you can call us toll free at 877-872-2806 to order or get more information. We are heading to the Club Industry Show in Chicago! If you plan on going, make sure to stop by our booth, #313. The exhibitor hall will be open the 5th & 6th. Create a unique atmosphere in your sauna! One of the three pillars of enjoying a sauna is sufficient humidity. Saunamaestro efficiently moistens sauna air, while its fountain creates a unique atmosphere. A large basin, in which you can also mix sauna fragrances, lengthens the life of the product. Made of pure, unique soapstone over two billion years old, which withstands high temperatures. Relax, soothe sore muscles, joints and let stress fade away in your very own sauna with our sauna room kit. Pour water over sauna heater rocks for traditional finnish steam sauna. Select from the most popular sauna wood paneling types, white aspen or western red cedar. Sauna room kits are designed for residential home saunas and commercial saunas (gyms, hotels, military fitness centers and more). We have studied saunas all over the world to perfect the Superior Sauna. The name Polar is your assurance of years of reliable sauna enjoyment due to the integrity of design and use of high quality materials. Sauna doors are essential for your sauna. Superior Sauna doors are properly concealed with rubber lining and a magnetic door lock. Parts of the doors were built to endure the hot temperature of the sauna with 8mm tempered glass in bronze and clear color. The door jamb is laminated with several slices of wood to prevent warping. Do you dream of having your own sauna? Start by ordering one of our free samples packs. See the quality of Superior Sauna components before purchasing your sauna kit. Includes samples of home sauna and commercial sauna room building materials. Before making a major purchase for the sauna of your dreams, get our sample pack and see Superior Sauna's quality.